Recording the county's lesser studied invertebrate orders, has again been profitable, with the first Nottinghamshire records of the Woodlice Cylisticus convexus (De Geer, 1778) and Trichoniscus pygmaeus (Sars, 1898) for many years. 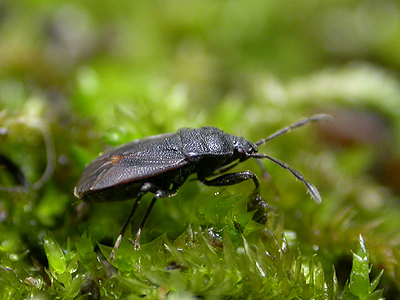 Cylisticus convexus (shown left) had previously been recorded from the old Boughton Tip (now known as Ollerton Pit Woods) in August 1986 (Langston, M.R.). Feeling that it was an under-recorded species in Nottinghamshire, our efforts to find it took several years before one was found in company with Oniscus asellus (Common Shiny Woodlouse), Porcellio scaber (Common Rough Woodlouse) and Armadillidium nasatum under some loose stones at the top of a stony embankment at the former Warsop Main Pit Top in November 2018. 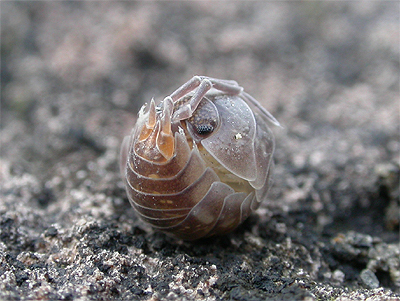 C. convexus can roll into a ball like several other species, but the long, pointed uropods and (diagnostically) the antennae remain exposed and drawn over the head. 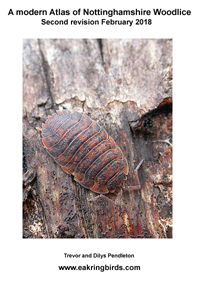 One of Nottinghamshire's smaller Woodlice, the pale Trichoniscus pygmaeus (Sars, 1898) had not been recorded in Nottinghamshire for many years. The only other county records were from West Bridgford in 1975 (Rundle, A.J.) and at Sutton Bonington in 1979 (Fussey, G.D.) and 1990 (Daws, J. ), but in 2018, we found single specimens at Market Warsop in March and Cockglode Wood near Edwinstowe in November, the latter specimen being in company with several Haplopthalmus danicus. 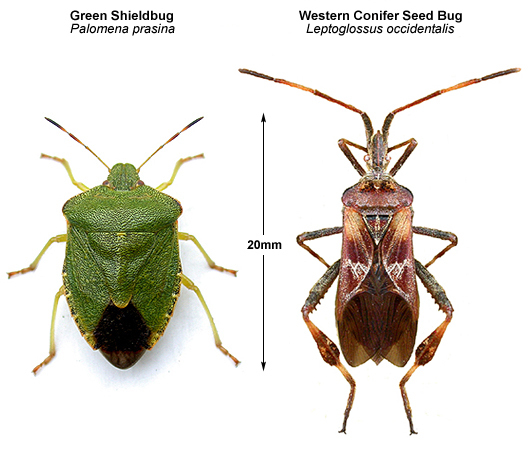 After a bumper year in 2017, just four records of the Western Conifer Seed Bug Leptoglossus occidentalis have been reported to us this year. Rather typically, these all occurred during the Autumn and following two reports in September, there were single records in October, before the county's latest ever record on November 25th. Most of Nottinghamshire's 29 known records have occurred during the Autumn, when there is obviously a genuine migratory movement, or adult dispersal prior to over-wintering. The last week of September with nine records and the first week of October with seven records, provide a clear peak in the county's known records at the time of writing (November 2018). This year's records include singles from the centre of Mansfield on 10/09/18 (Robinson, V.), Bestwood village on 27/09/18 (Tobin, S.) inside Wollaton Hall on 06/10/18 (Johnson, R.) and from Lowdham on 25/11/18 (Osborne, J.). Originally found new to Nottinghamshire at Attenborough NR back in 2016, when a female Steatoda nobilis (Thorell, 1875) was recorded on an interpretation panel on the reserve. A healthy population was then found at a north Nottinghamshire garden centre soon afterwards and other records have since followed. In 2017, we found a female at another garden centre - this time at Mapperley and we were recently able to add another site in the same area, with a record of a large female found in a hollow underneath a paving slab at a house on Gretton Road. Steatoda nobilis is obviously resident in many parts of suburban Nottingham now. On a weekly trip to the family home in early October, we decided to check a couple of plants of yellow flowering Antirrhinum majus, in the hope of finding the Mirid Bug Dicyphus escalerae (Lindberg, 1934). Antirrhinum majus has always been a common bedding plant at most city parks and urban gardens for many decades and they usually continue to flower, well into the Autumn, and on immediate inspection, numerous nymphs of varying astages of development and a couple of recently moulted adults were discovered. Their identity as Dicyphus escalerae was quickly confirmed and the county recorder was informed, later replying back that this was the first county record. Only known from the UK as recently as 2007, D. escalerae is probably widespread in many Nottinghamshire parks and gardens. Found on Antirrhinum majus, even isolated plants are likely to hold at least a few adults and numerous nymphs if checked. We checked the same plants again a month later on November 14th, and still found D. escalerae to be numerous, but with a greater percentage of adults to nymphs. For many years, Litargus balteatus (Le Conte, 1856) was only on the UK species list, on the basis of a number of specimens collected from Sherwood Forest in 1907. Originally an American species, it wasnt seen anywhere in the UK again until 1982 when it turned up in Leicestershire, followed by records from Norfolk in 2003 and 2007 when it was also found in Cambridgeshire. There have been several other records from different areas of the UK since, suggesting that it is finally on the increase. On October 19th 2018, we found a single specimen on the underside of a cut log, near the site of the old Sherwood Forest visitor centre, making it the first Nottinghamshire record for well over a century. Rob Woodward reports taking a single Box Tree Moth Cydalima perspectalis (Walker, 1859), from the Bagthorpe Garden Allotments in Sherwood, Nottingham on October 10th 2018. This represents the third county (and Nottinghamshire's third ever) record this year, all coming within the space of a few months. Rob suggests that the moth "may have arrived on the overnight south easterly winds from where it is more common, or possibly breeding in the area". The latter perhaps seems the most likely and it probably becoming established within the city itself. Interestingly, all three of the county's records, including singles from Bestwood Village on July 5th (Tobin, S.) and from Ravenshead on July 17th (McGeever, D. and McGeever, V.) all fall within a short north/south line of each other. Following his recent email exchange with Mike Fox of BWARS, Tony Kavanagh has brought to our attention, records of two species of Ant which are new to Nottinghamshire. The two additions are historical records of Formicoxenus nitidulus and Lasius platythorax. Formicoxenus nitidulus (Nylander, 1846) is believed to be a social parasite, making discreet nests within the large mounds produced by several Formica species. Known only from Wigsley Wood in the north-east of the county, it was recorded by Collingwood in 1955 and again in 1957, where it was presumably found within the nests of Formica rufa. 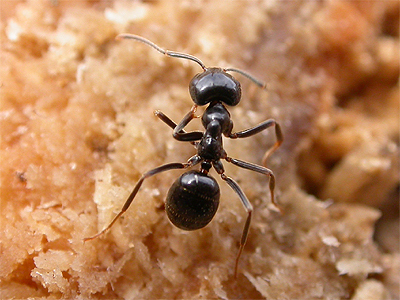 The other species is Lasius platythorax (Seifert, 1991), for which there is a single record from Langford Moor near Newark in 1914, which was identified from a specimen retained in the Natural History Museum in Dublin Museum by Mike Lush in 2007. 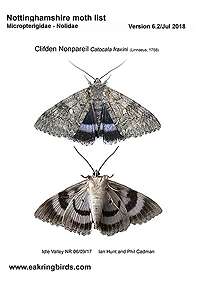 Both species have not been recorded since. Spiders of the Family Philodromidae (Running Crab Spiders), are typically fast moving spiders, characterised by their long legs, a generally oval abdomen and near circular carapace, with an overall rather flattened appearance. There are several species found in the UK, including Thanatus formicinus (Clerck, 1757) which was rediscovered in the UK for the first time in nearly 50 years at Clumber Park in 2017. But the UK list also includes the non-native Thanatus vulgaris (Simon, 1870). 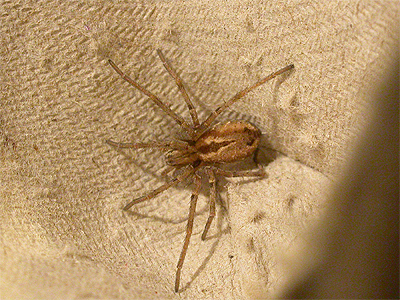 There are few officially reported records of this spider, yet a trawl of the internet revelas that it is often encountered in boxes of crickets or locusts (live food) intended for use as food for a number of exotic pets. It is unable to survive outdoors, so is only ever encountered indoors. There have undoubtedly been previous occurrences of Thanatus vulgaris in Nottinghamshire, but none seem to have ever been reported. So one we found inside a box of locusts at Market Warsop in September 2018, may well be the county's first reported record. After an absence of just over 110 years, the distinctive black Ant Lasius fuliginosus has been rediscovered at Netherfield Ash Lagoons. Sometimes known as the Jet-black Ant, the workers often form long trails up into trees and shrubs where they tend Aphids. Until this recent find (August), there was just a single Nottinghamshire record from Sherwood Forest in 1907 and it was believed that Lasius fuliginosus had long since died out in the county. Reappearing in the county was thought unlikely, as it appears to have suffered a decline in recent years and has always been an Ant of more southern counties. However, news of the discovery at Netherfield by Tony Kavanagh, was forwarded to us by Peter Smith, who informed us that workers were tending Aphids on Tansy (Tenacetum vulgare), which we later identified as being the Pink Tansy Aphid (Metopeurum fuscoviride). On September 1st 2018, we trapped a single of the Pyralid Duponchelia fovealis at MV light in our Market Warsop garden. Duponchelia fovealis is an adventive species, still with relatively few UK records. Although a migrant species, most UK records are believed the result of accidental importation on cut flowers, or house plants from southern Europe. We have recorded this moth twice, finding the county's first ever record freshly emerged on the skirting board of a room in a Mansfield nursing home on October 14th 2011. One was also trapped by Phil Lee at Misterton in 2013. Sheila Wright and John Osborne have recorded the third Nottinghamshire record of the Crane Fly Ctenophora ornata (Meigen, 1818), when a male was attracted to MV light at Budby South Forest on August 4th 2018. Ctenophora ornata (Meigen, 1818) is a large and spectacular Crane Fly, first recorded in Nottinghamshire at Clipstone Old Quarter on July 2nd 2009 (Pendleton, T.A. and Pendleton, D.T.). The record made Sherwood Forest become the most northerly site in the UK for this Red Data Book species, with other known UK sites including the New Forest and Windsor Great Park. 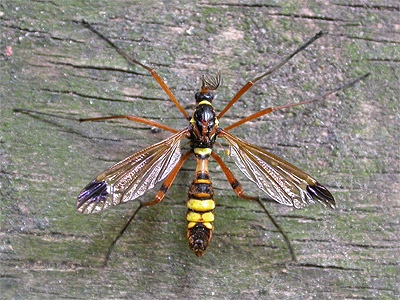 In 2013, there were reports of 'unusual' numbers of Ctenophora ornata reported from Windsor and following an email from John Kramer of the Tipulidae Recording Scheme to staff at the Sherwood Forest visitor centre in late July, a follow up moth trapping session produced the second record for Sherwood Forest on August 1st 2013 (Pendleton, T.A. and Pendleton, D.T.). This large Harvestman first appeared in The Netherlands in 2004 and still remains scientifically unidentified to species level. It is believed to have been introduced into Europe via importation and is a very invasive species, quickly forming large congregations numbering many hundreds on the shaded walls of buildings. Records from Germany, Switzerland and Austria came during the following years and France's first record was in 2009, the same year we found the first ever record for the UK on the wall of a house in Worksop. In September 2012, it was found by Paul Richards on a factory wall at Barnsley before we were finally located it again, on the walls of Worksop Priory in October 2012. In recent years Leiobunum sp.A has turned up in various parts of the UK, always in built up, or industrial areas. There has never been any doubt that it would be found at a number of other Nottinghamshire sites, but a third site has only just been located by Wil Heeney, who found a single specimen at Hollybeck Garden Centre near Oxton in late July. Nottinghamshire's ninth record of Lesser Emperor Anax parthenope (Selys, 1839) was found by Paul Naylor at Annesley Pit Top on 23/07/18. A rare migrant to the county, this is actually the site's third Lesser Emperor record within the space of 12 years. Nottinghamshire's first was at Holme Pierrepont on 20/06/98 (Critchley, A. ), followed two years later by one at Colwick CP on 13/08/00 (Dennis, M.C.). Another turned up at Netherfield Ash Lagoons on 16/07/02 (Woodward, R.) and there were subsequent records from Lound GP on 18/07/06 (Hursthouse, D.) and Annesley Pit Top on 28/07/06 (Dawson, M.) before one at Martin's Pond in Wollaton on 19/07/10 (Shields, T.). The most recent Lesser Emperor records have both been from the well watched Annesley Pit Top, with singles present on 27/06/11 (Naylor, P.) on 23/07/18 (Naylor, P.). Mistletoe (Viscum album) has a number of rather specialist invertebrates associated with it. But although widespread in the county, Mistletoe usually grows at the tops of mature trees and remains frustratingly inaccessible to the entomologist. But some Mistletoe growing within reach of Tim Sexton's beating tray in the middle of Beeston, provided Tim with the opportunity to search for the Weevil Ixapion variegatum, which itself would be a county first. Tim failed to find the weevil, but still turned up two species of Heteroptera new for Nottinghamshire. The first was Hypseloecus visci (Puton, 1888), a rare and possibly under-recorded Mirid Bug. First recorded in the UK as recently as 2003, there are still very few records and most of these are from counties where apples are grown commercially. Tim's other find was the almost equally scarce and probably under-recorded Anthocoris visci (Douglas, 1889). 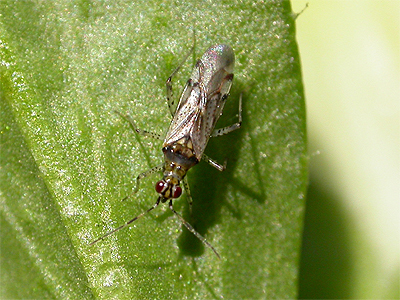 This is another species which owes its UK status to its preference for Mistletoe, on which it hunts for the Psyllid Psylla visci. Both species are believed to be new to Nottinghamshire. Originally an Asian species first recorded from the UK as recently as 2008, what looks to be Nottinghamshire's first record of the Box Tree Moth Cydalima perspectalis (Walker, 1859) came from Bestwood Village in early July. Probably introduced into the UK via the horticultural trade, this moth is now firmly established in the London area and spreading north. Regarded as a pest species of Box (Buxus sp), the moth shown left was trapped by Sean Tobin at Bestwood Village on July 5th 2018 and is the first record for VC56 Nottinghamshire, occurring about a fortnight before another was attracted to MV light at Ravenshead by David and Veronica McGeever. Our thanks go to Sean for allowing us the opportunity to photograph the moth. Good numbers of Glow Worms are once again to be found on Sherwood Heath near Ollerton, giving recorders the best site counts since 207 females on 27/06/08 and 212 females on 04/07/08. Highest count of the year so far was of 61 females on July 1st, but other notable totals have been 34 on June 27th, 37 on June 25th and 41 on June 18th. At nearby Budby South Forest, where two female Glow Worms were found in 2017, surveys undertaken as part of the Nottinghamshire Glow Worm Survey (NGWS), have provided counts of up to 13 females towards the end of June. But a count of 39 on July 1st, easily represented a new site record, with most females being in the grassy heathland between the access track running around the site and the A616. The Nottinghamshire Moth List we regularly publish has just been updated, following the recent records of Anania lancealis and Phtheochroa inopiana from Phil Lee's Misterton garden. Version 6.2/Jul 2018, replaces any previous versions published on www.eakringbirds.com. The list once again contains an up to date (November 2017) list of all the macro moths recorded in Nottinghamshire (VC56) but the list of micro moths still remains unverified. The species list incorporates the latest additions to the Nottinghamshire moth list and includes the new scientific species names, numbering system and order of species, as used in the new 'Checklist of the Lepidoptera of the British Isles' (D. Agassiz, S. Beavan, R. Heckford. 2013). The old Bradley and Fletcher numbers are still provided. Phtheochroa inopiana new to Nottinghamshire? Phil Lee reports two records of the Tortrix Phtheochroa inopiana, from his Misterton garden on June 27th, with a further record two nights later on June 29th 2018. Phil or ourselves, have been unable to trace any previous Nottinghamshire records of this sexually dimorphic species. The larvae develop and overwinter within the roots of Fleabane Pulicaria dysenterica, so this moth is potentially likely to occur if trapping near stands of the foodplant. On June 9th, we paid a visit to the Idle Valley NR. Its easy walking and there's good parking at the visitor centre, with usually plenty of interest around the car park to entertain the entomologist. It was in a quiet corner of the car park that we found a hoverfly which we didn't immediately recognise. At first glance it appeared dull looking, but when seen well, showed itself to be beautifully coloured, with a thorax of metallic bronze, purple and greenish tints. Soon identified as a male Riponnensia splendens (Meigen, 1822) the lack of recent county records suggest that it is not particularly common in Nottinghamshire, although it is widespread across parts of the UK and Wales. 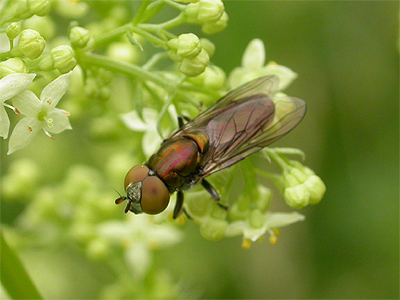 It prefers quiet, well vegetated spots and often frequents Umbellifer flowers. There are known VC56 records from Attenborough NR and Kirton Wood. The Dock Bug Coreus marginatus (Linnaeus, 1758) is continuing its rapid northerly spread through Nottinghamshire. In May 2017, we found it near to the Swinecote Road entrance to Sherwood Forest CP, which was a considerable distance further north from its previous most northerly limit of Gedling CP. We had recorded it from the rear of Brookfields Garden Centre at Mapperley a few days before, but then found several around the car park at Hundred Care Wood, situated on the B6045 Blythe Road just north of Worksop on June 10th. Nottinghamshire's first record seems to have been from Netherfield in 2012, with more recent records coming from Attenborough NR, Colwick Park and close to Nottingham City Hospital. 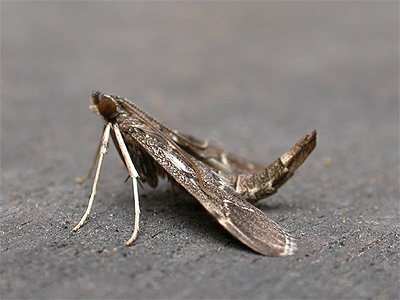 Late May and early June saw the arrival of both Silver Y and Plutella xylostella. We recorded our first Silver Y at Clipstone Old Quarter in Sherwood Forest on May 24th, but noted a distinct increase and arrival from May 27th. Ten Silver Y came to our garden MV light on May 30th and 11 on June 3rd. Despite large numbers of P. xylostella (Diamond-back Moth) around southern UK coasts, we have only recorded small numbers to date, following the first on May 30th. The arrival of our commoner migrant moths coincided quite nicely with records of Red Admirals Vanessa atalanta at Bestwood Sand Quarry and Nottingham City Hospital on May 22nd, and Painted Lady Vanessa cardui in the ASDA car park at New Ollerton on June 3rd. The Pyralid Anania lancealis new to Nottinghamshire? A specimen of the Pyralid Anania lancealis ([Denis & Schiffermüller], 1775), was recently found in Phil Lee's Misterton garden on May 25th 2018. Phil suspected the moth's identity, but posted an image for confirmation on a Lincolnshire lepidoptera forum. 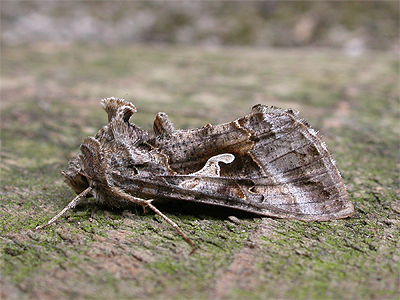 The moth was retained until identification had been confirmed and at the time of writing, is believed to be the first Nottinghamshire record. There are thought to be no Lincolnshire records and only two from Yorkshire. Its a beetle several of the county's coleopterists have been looking out for, for a number of years. And with a few records from neighbouring Leicestershire, it seemed only a matter of time before Platystomos albinus (Linnaeus, 1758) was found in the county. 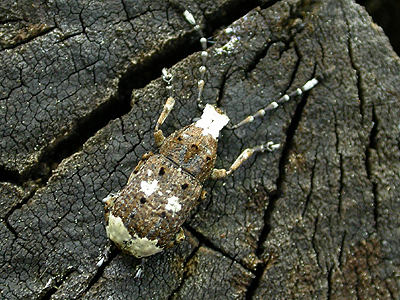 In the end, it was visiting entomologists Paul and Helen Brock and John and Denise Bingham, who found Platystomos albinus, sat on the end of a log at Sherwood Forest CP in late May 2018. When they alerted us to the record, they had no idea at the time, that it was almost certainly a county first. A quick check with other Nottinghamshire coleopterists, revealed that the record seemed to be a first for the county. However, it turns out that one was recorded last year (the specimen retained and photographed) found by Phil Lee at Treswell Wood in May 2017. Continuing its spread from north-western parts of Nottinghamshire, the Alder Leaf Beetle Agelastica alni (Linnaeus, 1758) has been found to have reached suburban Nottingham, when we recorded one in the grounds of Nottingham City Hospital on May 20th 2018. It was on one of several Alders of differing conditions, growing in the south-east corner of the hospital's yellow car park and is another addition to the varied invertebrate fauna to be found within the City Hospital's grounds. 2018 will certainly be remembered as being the latest Spring for many years and likely a very short one too. Finding any insects has been slow, despite some short-lived very warm April weather. We found butterflies to be thin on the ground and our first dates for all species so far, have been late. The cool start to 2018, has meant that there has been little of note found, but Attenborough Nature Reserve's assistant reserve manager Tim Sexton, recorded Phyllobius oblongus (Linnaeus, 1758) on the reserve in mid-May, which is only the second modern record for VC56 as far as we are aware. Earlier in May, Tim also recorded Cleopus pulchellus (Herbst, 1795), which is another uncommon Nottinghamshire weevil, with possibly just one other modern county record. An attractively marked species, it is one of several quite similar weevils found on Figwort (Scrophularia nodosa) but is without doubt the most uncommon. Our own recent and interesting records are limited. There has been very little moth trapping so far this year, but we did record the melanic aberration of Waved Umber (ab.fuscata) to our garden MV light on May 4th and the larva of Heath Rustic Xestia agathina (Duponchel, 1827) at Rainworth Heath SSSI in late April. Coleoptera highlights have again been few, but Agathidium seminulum (Linnaeus, 1758) at Clipstone Old Quarter in April, Phyllobius glaucus (Scopoli, 1763) and Hedobia imperialis (Linnaeus, 1758) at Cuckney Hay Wood in early May, are three notable records. The only other record of note, was the Lygaeid bug Drymus ryei (Douglas & Scott, 1865) at Sherwood Forest in April (see above photograph). Possibly the first record for Nottinghamshire, one turned up in a sample of moss and leaf litter at Sherwood Forest CP in late April and we have heard that it has also been found at Nottingham University's Jubilee Campus by Adrian Dutton. Found in the same ground layer/leaf litter habitat as Drymus sylvaticus, Drymus ryei has a much darker wing membrane, darker forewings and both pronotum and scutellum are also black, and is very easily confused with the more common D. sylvaticus. 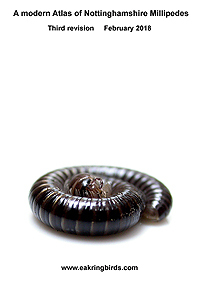 Only recorded as being new to Nottinghamshire in January 2016, when found at Pleasley Vale by Derek Whiteley, an example of this 4mm long millipede was found by Tim Sexton at Attenborough NR in early March. Easily missed due to its size and usually found under large stones in the Winter and Spring, Tim recorded the county's second specimen, underneath some discarded concrete in the reserve's car park. We've recently produced updates and revisions to several pdf publications, including a second revision of our Atlas of Nottinghamshire Woodlice, following the discovery of five new species in the county list since 2015. The third edition of our Modern Atlas of Nottinghamshire Millipedes also features several new species which have been added in recent years. Both Atlases have species summaries and distribution maps updated. 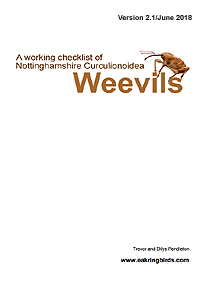 Two new pdf files include a working checklist to Nottinghamshire Weevils, based on the records of local recorders and organisations and data extracted from the National Recording Scheme for Coleoptera: Curculionoidea, and following several requests to provide an up to date review of Nottinghamshire Dragonflies, we've gathered together the many records we have been sent, in an attempt to provide a reasonably accurate assessment online. 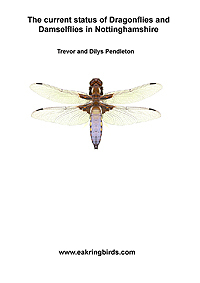 This pdf looks at the status of the county's 27 known species of Dragonfly and Damselfly, with species summaries and distribution maps. Adrian Dutton has recently confirmed that Colletes hederae (Schmidt & Westrich, 1993), is present in Nottinghamshire and has probably been here since 2016. Adrian stated in an email that 'plenty of nesting activity occurred in a sandy bank at the Nottinghamshire Wildlife Trusts Skylarks Nature Reserve. Plenty in September 2017 and believe it was nesting there in 2016'. Leptoiulus belgicus (Latzel, 1844) was new to Nottinghamshire on February, when found in a Mapperley garden. 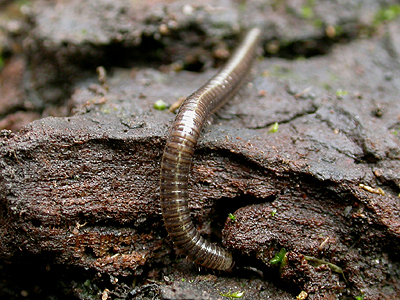 A Millipede with a distinct south-westerly distribution in the UK, largely occurring in South Wales, Devon and Cornwall, with few records from any counties of those. Interestingly, it was also recorded new to the Sheffield area in late 2017 (per Richards, P.) and so searching of well established suburban gardens may well be productive. Although not often an easy feature to see dependant on the lighting, the dark brown Leptoiulus belgicus has a distinct ID feature, in the form of a pale line running dorsally along its length. Yet more potentially interesting records have turned up within the large selection of invertebrate records sent to us in January. Among the Hymenoptera records is a single record of Colletes hederae (Schmidt & Westrich, 1993), which may be better known to some people as the Ivy Bee. Colletes hederae has been spreading steadily north over a number of years and the NBN Atlas shows it has now reached Norfolk and north Wales. A Nottinghamshire record could well be likely within the next few years, but there was an unconfirmed report of Colletes hederae from Woodborough in September 2017. The Western Conifer Seed Bug Leptoglossus occidentalis (Heidemann, 1910) is a large Squashbug (Coreidae) of North American origin and generally regarded as being a serious pest of Pines, with Scot's Pine (Pinus sylvestris) and Douglas Fir (Pseudotsuga menziesii) being particularly prone to attack. After being accidentally introduced into Italy in 1999, it spread rapidly across Europe and arrived in the UK as recently as 2007. It has since been widely recorded across the UK, south of a line extending from Liverpool to Newcastle-on-Tyne. 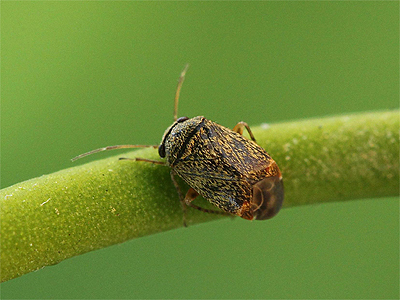 The speed of its range increase across the continent has been quite staggering, yet is similar to other invasive invertebrates that have reached the UK in recent years, such as the Harlequin Ladybird (Harmonia axyridis) and the Horse Chestnut Leaf Miner (Cameraria ohridella). Nottinghamshire's first record was from Eakring in 2009 and it has been recorded annually since, apart from a blank year in 2013. Most records come during the late Summer and Autumn and largely seem to have come from urban areas. The last week of September (eight records) and the first week of October (six records) provide a clear peak in the county's known records. In January 2018, we were given access to a number of invertebrate records held by the Nottinghamshire Biological and Geological Record Centre. Among the records were a total of nine records for Leptoglossus occidentalis, which is considerably more than double the number of records from any previous years. The 2017 records include single specimens at Stapleford (Chambers, S) on 24th August; Bramcote (Smart, G.) on 14th September; Sherwood Forest NNR (Turner, G.) on 18th September; Upper Saxondale (Cockayne, H.) on 24th September and at Highbury Vale (Watts, J.) on 28th September. Following these were records from Kirkby-in-Ashfield (Tarpey, L.) on 2nd October; Carlton (Skinner, M.) on 2nd October; Stapleford (Clarke, B.) on 23rd October and finally, a single at Cropwell Butler (Dulwich, P.) on 4th November. The tiny Andromeda Lacebug Stephanitis takeyai (Drake and Maa, 1955) was originally thought to have been recorded as new to Nottinghamshire in August 2016, when a single specimen was swept from marginal vegetation at Attenborough NR (Sexton, T.). This record seems to have been beaten though, as among a large number of invertebrate records sent to us by the Nottingham Biological and Geological Record Centre, was an earlier record of Stephanitis takeyai from New Balderton, Newark on July 3rd 2015, beating the Attenborough record by just over a year. There are further records of Stephanitis takeyai from Market Warsop in August 2017 (Pendleton, T.A. and Pendleton, D.T.) and from Attenborough village (Sexton, T.) in September 2017, suggesting that it is probably well established in the county. Among a large number of lepidoptera records sent to us by the Nottingham Biological and Geological Record Centre in January, was a record of Nemapogon variatella (Clemens, 1859) from Clumber Park in 2004. The moth was recorded by Andy Godfrey and it seems to have been unrecorded in Nottinghamshire previously and we know of no other records since. 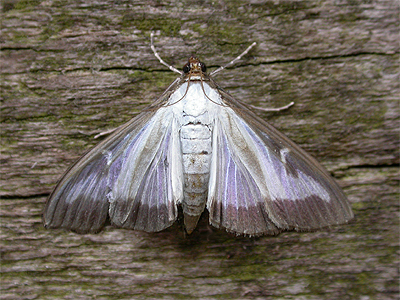 Possibly having two generations a year, the adult occurs between March and August and closely resembles Nemapogon cloacella, but with slightly narrower wings and a whiter head. The larvae feed on bracket fungus and possibly on grain and stored produce.